All along the eastern seaboard, the American struggle for independence rages. In the British-held southern port of Mobile, Alabama, the conflict brewing is quieter--though no less deadly. The lovely Frenchwoman Lyse Lanier is best friends with the daughter of the British commander. Rafael Gonzalez is a charming young Spanish merchant with a secret mission and a shipment of gold to support General Washington. As their paths cross and their destinies become increasingly tangled, Lyse and Rafael must decide where their true loyalties lie--and somehow keep Lyse's family from being executed as traitors to the British Crown. With spectacular detail that brings the Colonial South alive, Beth White invites readers into a world of intrigue and espionage from a little-known side of the American Revolutionary War. Her richly textured settings and characters delight while fast pacing and closely held secrets will keep readers turning the pages. 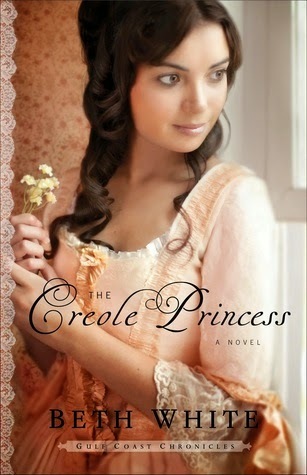 The Creole Princess is the second book in the Gulf Coast Chronicles series, but it works beautifully as a stand alone novel. Taking place during the American Revolution, the author managed to pull me into another historical novel full of the worlds of politics and people. The characters are well developed and the ways that their threads intertwine kept me turning page after page. If I had any complaint it was that the ending felt slightly rushed..or maybe that was just me not wanting it to be over quite yet.